I just stumbled upon Angel Fire, which has a fantastic, must see list of place value games! Roll Bundle Win was inspired by "Make Your Number." Kids use their base ten and addition skills to build numbers as quickly as they can! 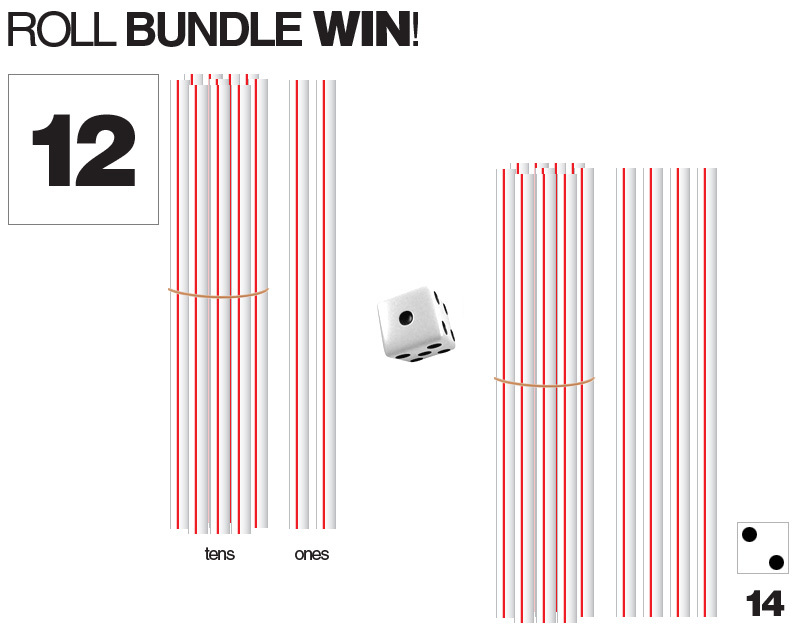 Roll Bundle Win - 2 player place value game. Kids pull a two digit mystery number out of a bag. Next, they both build the number. For example, they pick 12. They show how many tens and ones are in 12 by using drinking straws (bendy part cut off) and rubber bands. So, they should have one bundle of ten drinking straws and two drinking straws set aside. Now, the competition begins! Kids roll one die and continue to build on to their number. If they roll two, they add two drinking straws to their number. So, starting with 12, now they have 14. Whoever makes the number the fastest scores a point. If they tie, they both get a point. The tricky part is the bundling. Say they have the number 14. They roll an 8. The kids have to make a bundle with their straws (count and rubber band them). They should have 2 bundles of straws and two out to equal 22 (2 tens and 2 ones).